Hollywood moves at lightning speed, or so it would seem from the news. The truth is that behind every new hit television show or award-winning movie are years of hard work, and years of waiting. PASSENGERS took nine years to make it from script to screen. GLOW was in development for more than three years before it premiered. Even once you’ve sold a project, negotiations can take the better part of a year. Here are my top tips for staying sane when the wait is maddening. Move on to other projects. Yes, I know you feel deeply and personally attached to the idea you just pitched or the script you just turned in, but it will only be torture for you if you’re checking your e-mail every five minutes for an update from your reps. The best thing you can do is to focus your energy on a new project. This is beneficial in two ways: it will help to channel your anxiety and add to your content creation. This way, if your original project doesn’t move forward, you’ll already have something new and exciting to focus on. And if it does, you will have another killer sample to show off your writing chops. Do yoga or other anxiety-reducing exercises. Stress and its effects on the human body are very real. And writers are some of the most stressed people in the business. If you’re feeling anxiety while waiting on the status of a project, try an anxiety-reducing exercise. Yoga, a hike in the sunshine, or a kick-boxing class are great ways to boost your endorphins (which combat stress) and get you out of the house. You might be surprised by how different you feel after just one session. Have a life outside of the industry. If your only activity is writing and your only friends are other writers, you can become hyper-focused on the minutia of the business, which won’t serve you or anyone around you. The key is balance. Try a new hobby that has nothing to do with writing or the entertainment industry. Make friends who don’t work in the business. Sign up for a class that focuses on a completely new skill. This will help you channel your energy into something new, free from the pressures you feel in your writing career. And, who knows, you might actually have fun. How long has it been since you had fun? Make use of the downtime. It’s a glorious thing to be finished with a project. While you’re waiting on a “yes,” a “no,” or for a contract to come through, take advantage of your free hours. Travel. Take a day trip. Meet new people. See new places. Use this opportunity to have new experiences and broaden your perspective. Every new thing you learn and experience is something you can draw from and put on the page later on. Writers are observers of life, so go out and observe. 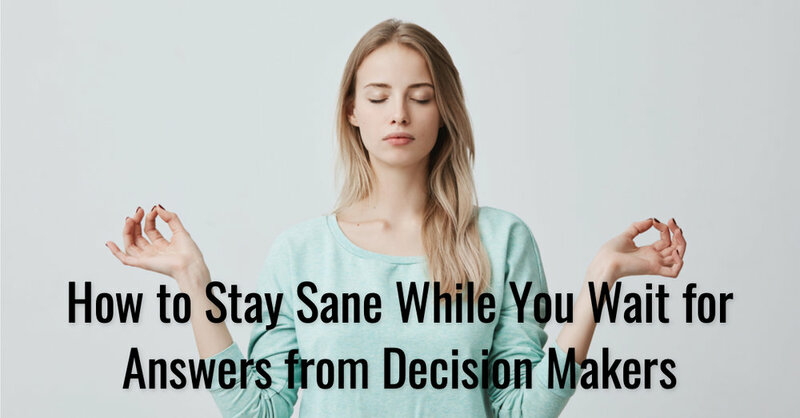 How do you stay sane while waiting for answers from decision makers? I’d love to know! Tweet me @CaroleKirsch.